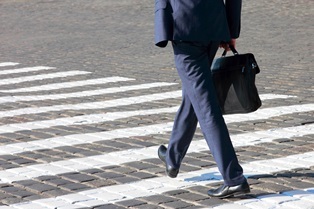 What are the most common causes of pedestrian accidents? Do I need to hire a lawyer for my claim? What should I ask for from the insurance company to settle my claim? At Neblett, Beard & Arsenault, we find that many Louisiana pedestrian accident victims want to know the same things. That’s why we have collected our answers to the most frequently asked questions. Please feel free to browse through our responses—perhaps you’ll find the answer to the burning question that is keeping you up at night. Does there have to be a collision to recover damages for my pedestrian injury? Pedestrian accidents don't always involve a collision with a motor vehicle. 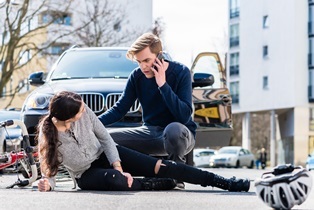 If you were hurt taking evasive action to avoid being struck by a car or truck, you may still be entitled to compensation via a personal injury claim. A driver loses control of his vehicle and jumps a curb. You are not struck by the vehicle but suffer a broken ankle trying to avoid the collision. An inattentive driver runs a red light. You're in the crosswalk and dive out of the way to avoid being hit. You suffer a mild concussion and are experiencing continuing back pain. A drunk driver going the wrong way down a one-way street hits another vehicle. The force of the collision pushes both vehicles toward you. Your friend pulls you out of the way, but flying debris causes several cuts that require stitches and leave scars on your face. In all of these cases, the motorist could be held responsible for damages that occur. Even though he didn't directly hit you, his lack of care and failure to obey traffic laws are the reasons you were hurt. If you were jaywalking when the accident occurred, it's possible you might be found partially at fault. However, this does not mean you're ineligible to file a claim. Someone who is partially at fault simply has his settlement proportionally reduced by his assigned percentage of fault. Medical expenses and lost wages are called economic damages because the value can be supported by invoices, bills, bank statements, or pay stubs. Pain and suffering damages are referred to as noneconomic damages because this type of compensation can't be objectively measured. However, it is common to use a multiplier of medical expenses to calculate the pain and suffering compensation an injured person should receive in a personal injury claim. The multiplier is assigned based on the severity of the injury, typically ranging from 1 to 5 with the highest multipliers reserved for permanently disabling injuries or injuries that require extensive recovery periods. After any accident, it's vital that you seek medical attention as soon as possible. Even if you feel that your symptoms are minor and may resolve on their own, you could be more seriously injured and not realize it. You also need to have medical records that verify your injuries were caused by the accident. Take photos and/or a video of the accident scene from as many different angles as possible. Photograph your injuries immediately and as they heal. Write down a detailed description of how the accident happened while it's still fresh in your mind. Request a copy of the law enforcement officer's report for your records. Louisiana has a one-year statute of limitations for personal injury claims, but it's best to contact an attorney as soon as possible. As time passes, it becomes harder to locate the necessary evidence to build a successful case. Personal injury attorneys accept cases on a contingency fee basis. Your attorney will accept a percentage of the final settlement as a fee for his services. This allows you to obtain representation without any upfront expense. Can I receive compensation if I'm hit by a car while running? Jogging may be a great way to stay in shape, but runners are vulnerable to organ damage, paralysis, and other severe injuries when they're involved in pedestrian accidents caused by distracted or careless motorists. Compensation may be available, but you'll need to follow some basic steps to protect your legal rights. 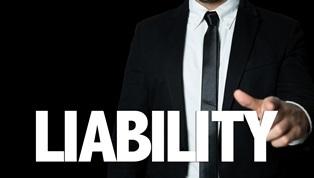 Determining who is responsible for your injuries is the first step in seeking compensation. Runners are legally required to use the sidewalk when one is available. In the absence of a sidewalk, there is no law stating which side of the road you should be on. Studies have shown jogging against traffic may reduce the risk of injury, but you won't be considered negligent if you were jogging with the flow of traffic, as long as you were clearly on the shoulder of the road. Running with headphones is quite common, but music that is too loud may affect your ability to remain alert to your surroundings. While runners aren't generally considered at fault when an accident occurs, you could be held partially responsible if you darted into traffic or ignored a crossing light because you were distracted by your music. The easiest way to prove liability for your injuries is to learn if the driver was ticketed following the accident. Citations such as those for speeding, running a red light, or texting while driving may be used to support your claim that the driver who hit you was negligent. However, witness testimony, surveillance video, or testimony from an accident reconstruction expert could be used if needed. If the driver who hit you was operating a car belonging to another party, you might be able to file a claim against the vehicle owner. This type of case often involves someone driving a vehicle owned by an employer such as a pizza delivery or UPS driver. Employers have a legal responsibility for the actions of their workers. If your accident is caused by an uninsured driver or someone with insufficient coverage to account for all of your injuries, your own auto policy, Personal Injury Protection coverage, or Med-Pay coverage could be used to pay for some of your expenses. Regardless of who is legally responsible for your expenses, documenting your damages is essential. You'll need to provide copies of your medical bills, pay stubs proving lost wages, and testimony from expert witnesses about how your injuries will impact future medical needs and earning potential. Runners hit by cars often suffer injuries requiring lengthy treatment. However, insurance companies tend to be more interested in protecting their bottom line than making sure an injured runner has the resources necessary to recover. The best way to protect your financial future after suffering injuries in an auto accident is to seek the assistance of an experienced attorney who can advocate for your needs throughout the process of resolving your claim. Your attorney can gather evidence to prove liability, document your damages, find relevant experts to testify on your behalf, and negotiate with the insurance company as needed. Louisiana has strict statute of limitations laws for personal injury claims. In most cases, you have one year from the date of the accident to file your claim or you lose your right to compensation. If I’m injured while riding my bicycle, who pays for my damages? If you are injured in a bicycle accident, the first step in recovering damages is determining who is at fault. Depending on the circumstances, you may be able to seek damages from multiple parties. If the driver who caused your accident is cited with an offense such as texting while driving, speeding, running a red light, or driving under the influence, you'll have a fairly clear-cut case for negligence when you file a personal injury claim. When an accident is caused by a negligent driver, the driver is the person who is financially responsible in the majority of cases. However, if the driver was driving a vehicle that belonged to a third-party, you may have a claim against the vehicle owner. For example, if a driver hits you while he is making deliveries for his employer, you would likely seek damages from the employer because companies are legally responsible for the actions of their workers. Another common example of a third-party claim in a vehicle accident involves negligent entrustment, where someone knowingly allows an unlicensed or unsafe driver to operate his vehicle. When more than one party is responsible for the accident, you can file a claim against everyone involved to seek damages in accordance with their assigned percentage of fault. The same rule applies if you are partially at fault for the accident. You can still seek to recover damages, but your settlement is reduced by your assigned percentage of fault to reflect your own liability for your injuries. Although liability insurance is required by law, there are still many drivers in Louisiana who do not carry the mandated coverage. Thousands more have only the legal minimum, which may not be adequate if you've been left with serious injuries. If you're involved in an accident with an uninsured or underinsured driver, your own auto policy's Personal Injury Protection (PIP) coverage or Med-Pay coverage may be used to pay for some of your expenses. If your bike accident was caused by potholes, cracked pavement, damaged signs, or other evidence of poorly maintained roads, the city or state agency responsible for maintaining the road may be liable for your injuries. In this type of case, it's vital that you contact an experienced attorney as soon as possible. There are special rules that must be followed when seeking damages from a government agency. Sometimes bike accidents can be the result of equipment on the bike that isn't working properly. For example, your front brake cables may fail and prevent you from stopping in time to prevent an accident. When this happens, you can file a claim against the manufacturer to seek compensation for your resulting accident expenses. Expert testimony will be needed to support your claim for damages if your injuries have left you permanently disabled. Life care planning experts can help estimate the cost of your future medical needs, while economic loss experts can assign a value to the lost future earning potential caused by your disability. Personal injury law is quite complex, and insurance companies are often in no hurry to provide a settlement. The best way to ensure that you receive the compensation you need to move forward with your life is to enlist the services of an experienced attorney. The legal team at Neblett, Beard & Arsenault can advocate for your needs throughout the process of resolving your claim. Contact us online or call us directly at 318.588.6303 to schedule a free, no-obligation case review.